Henry Hargreaves and Caitlin Levin met over several glasses of rosé and quickly recognized their shared passion for all things food, photography, travel and art. Their collaborations have spanned a decade, and they continue to push the boundaries always attempting to find a balance between beauty and the unthinkable. With food as their favored medium, they always manage to turn the mundane into works of art. Below are some of the more engrossing photos from their collection. 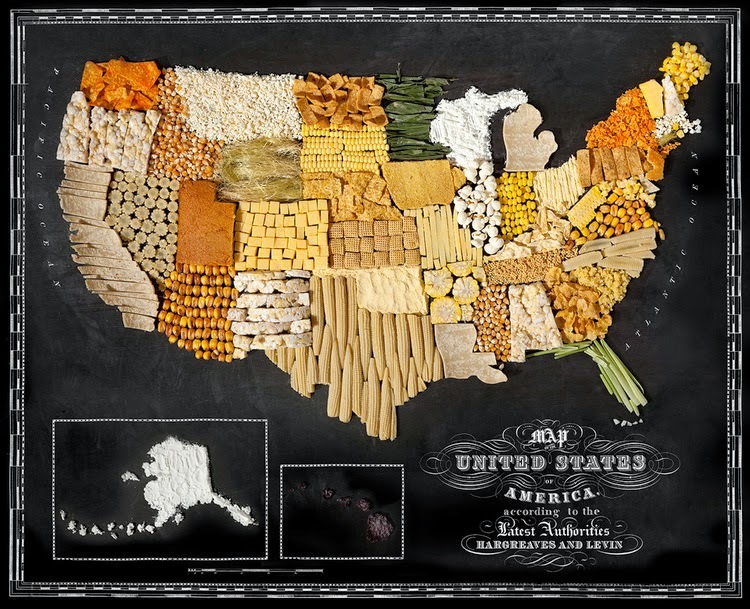 Their food maps documents the inconic food of countries and continents and transforms them into tasty typography. Iconic Rothko paintings recreated from rice. Re-creating museums such as the Guggenheim, the Louvre, and the Tate Modern, Henry and Caitlin masterfully created these art galleries made from candy and gingerbread. The Louvre Paris – Pyramid extension (Gingerbread, hard candy, licorice). Solomon R. Guggenheim Museum New York – Frank Lloyd Wright (Icing, gingerbread, cotton candy, candy wrappers, licorice and sugar). Tate Modern London – modern extensions, Herzog & de Meuron (Gingerbread, hard candy, cotton candy and bubble gum). This chilling photo essay re-creates death row inmates’ final meals before being executed.